Purpose The aim was to obtain the best results when dealing with previously operated cases of strabismus, as regards the restoration of ocular alignment, regaining ocular motility at least in the central field and at the same time aiming at preserving equal vertical width of the palpebral fissure in both the eyes. Participants and methods Effective strategies for strabismus reoperations are controversial, and should be tailored to each patient, depending on the specific history and findings. The first decision is to operate on previously operated muscles or fresh muscles. This should be influenced by many factors, in part by whether we are treating an undercorrection or an overcorrection, limitations of rotations, and incomitance, and by the vertical width of the palpebral fissure in the two eyes. Also many important decisions should be made intraoperatively based on the muscles integrity, whether slipped, lost, tight, hypertrophied, and also according to forced duction test. Results The total number of cases included in this study were 175 patients. Most of them were exotropic, 102 (58.3) cases, 67 women and 35 men, most of them (80 cases, 78.5%) were residual or recurrent. Esotropia constituted 59 (33.7%) cases, most of them were residual (46 cases). New types of deviation presented in 8% of cases. Management decision depended on the presenting deviation, its angle, ocular motility and any limitation, forced duction test, vertical width of the palpebral fissure, and modified according to the anatomical findings during the surgery. Conclusion A proper plan for a strabismus reoperation takes into consideration a number of factors preoperatively, and the surgeon should be prepared to modify his plans in each patient according to the intraoperative findings. One of the problems the ophthalmologist can meet in his clinical work is to have to deal with a case of strabismus previously operated elsewhere, sometimes without knowing the previous condition, or the data of the previous extraocular muscle surgery, and so has to diagnose properly if this strabismus is a residual, consecutive, or appearing after certain complication of a previous strabismus or nonstrabismus surgery. The patient presentation might be either a complication of a previous strabismus surgery such as less surgery or undercorrection leading to residual strabismus. Residual or recurrent strabismus is a common problem found after strabismus operations. According to previous reports, the incidence of undercorrection and recurrence after the correction of esotropia varied from 20 to 40% ,, and the incidence of undercorrection and recurrence of exotropia varied from 22 to 59% . More surgery or overcorrection leads to consecutive strabismus. Consecutive exotropia (XT) is manifest exotropia that develops either spontaneously or after optical or surgical treatment in a patient that formerly had esotropia (ET). It has been reported in 4–27% of patients after surgical treatment of esotropia ,. A complication happening during the previous strabismus surgery such as lost muscle, slipped muscle, or fibrosis and adhesions leading to restrictive strabismus, might be the cause of the presenting strabismus, where the forced duction test reveals information about mechanical limitations to full ocular rotation. When voluntary ocular rotation is limited, and the forced duction test is completely free, paresis of an extraocular muscle is suggested . Sometimes there is appearance of a new type of deviation not related to the previous surgery as inferior oblique overaction or dissociated vertical deviation . Also, strabismus may occur after retinal detachment surgery and is reported by many authors ,. Recession of the horizontal rectus muscle was found to cause vertical widening of the palpebral fissure ,, so the vertical width of the palebral fissure in both eyes is considered in the choice of muscle surgery in order to preserve equality of the vertical width of the palpebral fissure in both eyes. The participants of this study were cases of strabismus, presenting to the ophthalmology clinic, in a center in Alexandria, from January 2014 till the end of December 2016, previously operated from strabismus or other ocular surgery, and coming to correct the cosmetic appearance and followed up till the end of December 2017. The total number of cases were 175 patients, 110 of them were women and 65 were men. Their age ranged from 6 to 55 years (mean 38 years). Informed written consent was taken from every patient. The methods of examination started by a questionnaire to try to diagnose the type of strabismus, by asking the patient and his family about the original deviation before any surgery; the patients were also asked about available old photographs of childhood. Then routine examination for strabismus including the type of presenting deviation whether esotropia, exotropia, or hypertropia, the angle of deviation in various gaze directions, using the synoptophore and the prism and cover test, visual acuity and refraction was very important to detect the weak or amblyopic eye, to know the originally deviating eye, and the relation to accommodation. Ocular motility examination, duction, versions, and vergence to diagnose any defective motility could be paralytic and might direct the diagnosis to a lost or slipped muscle or restrictive that might need a completely different way of management. The width of the palpebral fissure is measured in the two eyes with the eyes open and eyes looking straight forward at the widest part, the junction of the medial third and lateral two-thirds of the palpebral fissure with the ruler and compared in both eyes. Forced duction test, done under general anesthesia was performed at the beginning of the surgery to differentiate paralytic from restrictive strabismus in cases where movement is defective in the direction of action of any of the muscles. In cases where there is no limitation of ocular motility, and negative forced duction test, and the palpebral fissure of both eyes of equal width or within 1 mm difference, the management was the easiest for no special concerns. In cases with positive forced duction test, meaning restrictive strabismus, caution was taken as to avoid resection of the antagonistic muscle, in order to prevent enophthalmos, pseudoptosis, it was better in these cases to operate on the muscle that showed restriction by forced duction test, releasing the restriction as the first step of surgery. The total number of cases was 175 patients 110 women and 65 men. 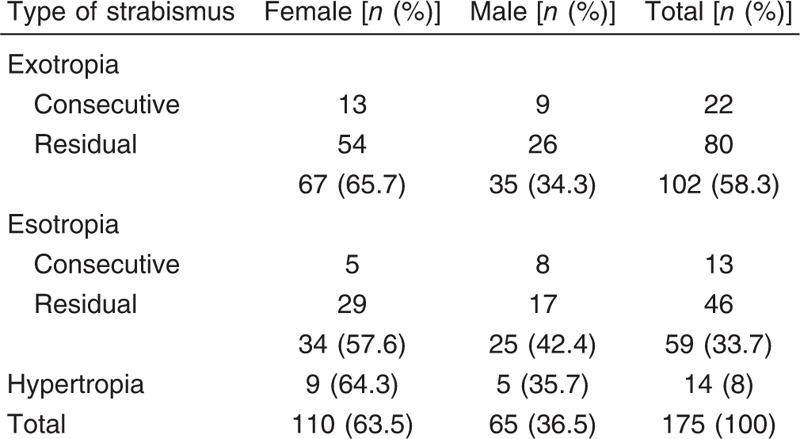 Exotropic patients constituted the majority, and were 102 (58.3%) patients; esotropic patients were 59 (33.7%) patients while hypertropic patients were 14 (8%) ([Table 1]). According to the history of preoperative deviation, previous photographs, and some medical reports available with patients, which were only 42 reports, exotropia was classified into residual and consecutive, and it was found that it was residual in most of the cases, that is in 80 patients of total exotropia of 102 (i.e. in 78.4%) ([Figure 1],[Figure 2],[Figure 3],[Figure 4]) while the rest 21.6% of exotropia were consecutive and these were cases of congenital esotropia operated in childhood with more recession of medial recti or more than two muscle surgeries ([Figure 5]), or complication during muscle recession like a slipped muscle ([Figure 6]). Figure 1 A lady with left residual exotropia, forced duction was negative, left vertical palpebral fissure height was wider, recession is avoided in this eye, operated by left medial rectus plication, preoperatively and postoperatively. Figure 2 A lady with right residual exotropia, forced duction test negative, right palpebral fissure wider, operated by full right medial rectus plication and 5 mm right lateral rectus recession, strabismus and palpebral fissure width are corrected postoperatively. Figure 3 A young lady, presenting with left residual exotropia, negative forced duction test, and left wider palpebral fissure, operated by left medial rectus plication, preoperative and postoperative. Figure 4 A lady with right residual exotropia, forced duction test negative, right wider palpebral fissure, recession is avoided, operated by right medial rectus plication, preoperative and postoperatively. Figure 5 A girl presenting with consecutive exotropia, previously operated in childhood by bimedial rectus muscle recession and left lateral rectus muscle resection. Forced duction positive, recession of the left resected lateral rectus was performed, preoperative and postoperative. Figure 6 A girl with consecutive exotropia, previously operated in childhood by bimedial rectus muscle recession and complicated by a slipped muscle. Defective adduction was noted in both eyes, and slipped medial recti were reattached and sutured in place in the sclera, preoperative, intraoperative, and postoperative. Cases presenting with esotropia were mostly residual, due to undercorrection of congenital esotropia ([Figure 7]); also esotropia was reported in cases after operation of retinal detachment ([Figure 8]). Figure 7 A young lady, previously operated in childhood for esotropia, re-recession of the two medial recti is performed, preoperative and postoperative. Figure 8 A lady presenting with left esotropia after retinal detachment surgery, defective abduction, positive forced duction of left medial rectus, and left narrower palpebral fissure. Dissection of adhesions and left medial rectus recession by the hang-back technique. Vertical deviations were 14 (8%) cases, and were 12 cases of inferior oblique overaction and two cases of dissociated vertical deviation appearing in cases of previously operated congenital esotropia and not related or resulting from the previous horizontal surgery ([Figure 9] and [Figure 10]). Figure 9 A girl presenting after being operated from congenital esotropia, with bilateral superior oblique muscle palsy, right more than left, preoperative. Figure 10 Postoperative, after bilateral graded inferior oblique recession. Forced duction test was positive in 41 exotropic patients, and in 11 esotropic patients as detected intraoperatively, and none of the vertical deviations, and this important step was considered by first releasing the tighteness and muscle restriction, during surgery, repeating the test till being negative, before deciding to resect the antagonistic muscle, to prevent severe complications such as enophthalmos and pseudoptosis ([Figure 11]). Figure 11 A girl who had previous three operations in the right eye, eye totally immobile, enophthalmic, hypertropic, forced duction test positive in all muscle directions, only exploration and dissection of fibrosis, traction sutures over the medial and lateral recti to ameliorate the hypertropia. The vertical palpebral fissure width is measured and compared in both eyes, and the difference of 1 mm or more is noted, so that the type of surgery is decided either to widen the narrower fissure by muscle recession, or to narrow the wider one by choosing muscle resection in this eye. Among the total number of cases, wider palpebral fissure in one eye was noted in 73 patients, in 63 exotropic and 10 esotropic patients. Residual or recurrence of exodeviation represented the main cases of this study. They represented 80 cases of the total 175, that is, 45.7% of the total cases presenting for reoperation. Residual or recurrence of exodeviation is a major concern after surgery of intermittent exotropia. Several authors recommend slight overcorretion during the immediate postoperative period in order to prevent long-term recurrences . Residual or recurrent esotropia is a common problem following bilateral medial rectus recessions for esotropia. The surgeons had to perform secondary surgery according to previous surgical pattern ,. Surgical treatment of undercorrected and recurrent strabismus can be chosen by many pediatric ophthalmologists. Provided that errors of measurement and restrictive factors have been eliminated and further surgery is indicated, the surgeon may choose one of the different surgical approaches for correcting residual or recurrent strabismus . In this study, residual strabismus surgery was decided and planned after the correction of refractive error, measuring the deviation with the provisional decision of the amount of surgery recession or resection that is needed. The choice depended on the forced duction test, if positive leads to choosing first to relieve the restrictive part, and then the difference of the vertical width of the palpebral fissure make the surgeon choose to resect or plicate a muscle in the wider side or to recess a muscle in the narrower eye, so as to equalize the palpebral fissures in the same time of correcting the ocular deviation. Unwanted alterations in the lid postion are among well-known complications of extraocular muscle surgery. In the literature, several studies have evaluated changes in the vertical palpebral fissure height (VPFH) following vertical strabismus surgeries, especially in cases of inferior rectus recession . More recently, there have been a growing body of evidence indicating widening of VPFH following unilateral or bilateral horizontal rectus muscle recession . For the consecutive strabismus, either more muscle was recessed in congenital esotropia, this is detected by the new insertion of the medial recti that is found intraoperatively to be more posterior, and these cases were managed by advancement of the medial recti even to the original insertion if needed, specially in hyperopic accomodative type, or complication has happened as slipped or lost muscle during the previous surgery, and in these cases, the bulk of the medial recti is sutured within its sheath and sutured to the sclera or more muscles than needed were operated, as recessing the two medial recti muscles, and resection of lateral rectus, and in these cases the resected lateral rectus is recessed to undo the effect of the resection. The recession of the previously resected lateral rectus not only will correct the consecutive exotropia and restore the primary position alignment, but will relieve the restriction of the lateral rectus and widen the palpebral fissure in this eye as well. In this study, we concluded the important points to consider during reoperation of the strabismus to achieve the best results: first to consider the original deviation and the presenting deviation, and whether this is an undercorrection, residual strabismus, or an overcorrection or consecutive strabismus, the angle of deviation, the extraocular muscles if normal, paretic or restrictive, and the forced duction test importance in this differentiation. The intraoperative findings that lead to modifying the plan of surgery also need to be considered. Also, the VPFH in both eyes is considered to plan a widening or a narowing surgical procedure, so as to achieve the best cosmetic results. 1Wang T. Surgical treatment for residual or recurrent strabismus. Int J Ophthalmol 2014; 7:1056–1063. 2Ceylan OM, Gokee G, Mutlu FM. Consecutive exotropia: risk factor analysis and management outcomes. Eur J Ophthalmol 2014; 24:153–158. Yurdakul NS, Ugurlu S. Analysis of risk factors for consecutive exotropia and review of the literature. J Pediatr Ophthalmol Strabismus 2013; 50:268–273. Metz HS. Forced duction, active force generation, and saccadic velocity tests. Int Ophthalmol Clin 1976; 16:47–73. Wilson ME, Parks MM. Primary inferior oblique overaction in congenital esotropia, accommodative esotropia and intermittent exotropia. Ophthalmology 1989; 96:950–955. 6Kasbekar SA, Wong V, Stappler T, Durnian JM. Strabismus following retinal detachment repair: a comparison between scleral buckling and vitrectomy procedures. Eye (Lond) 2011; 25:1202–1206. Arman F, Guyton D. Strabismus after retinal detachment surgery. Curr Opin Ophthalmol 2000 11:207–210. Santos de Souza Lima LC, Velarde LG, Vianna RN, Herzog Neto G. The effect of horizontal strabismus surgery on the vertical palpebral fissure width. J AAPOS 2011; 15:473–475. 9Lee SB, Heo DW, Lee HM, Lee YH. Widening of palpebral fissure due to lateral rectus muscle recession. J Korean Ophthalmol Soc 2013; 54:1269–1274. Tibrewal S, Singh N, Bhuiyan MI, Ganesh S. Factors affecting residual exotropia after two muscle surgery for intermittent exotropia. Int J Ophthalmol 2017; 10:1120–1125. Olitsky SE, Kelly CJ, Lee H, Nelson LB. Unilateral rectus resection in the treatment of undercorrected or recurrent strabismus. J Pediatr Ophthalmol Strabismus 2001; 38:349–353. Gunaskera LS, Simon JW, Zobal-Ratner J, Lininger LL. Bilateral lateral rectus resection for residual esotropia. J AAPOS 2002; 6:21–25. Kim DB, Meyer DR, Simon JW. Retractor lysis as prophylaxis for lower lid retraction followinginferior rectus recession. J Pediatr Ophthalmol Strabismus 2002; 39:198–202. Abtahi MA, Zandi A, Mandegarfard E, Ardakani HJ, Mahakid Abtachi SH. Lateral rectus muscle recession and the vertical palpebral fissure height: to do or not to do inter-muscular septum dissection? Int J Ophthalmol 2018; 11:1953–1955.